The dividing line between CN88 and CN89 is 49° lattitude. But, perhaps because of errors of early surveying, the Canadian border begins at about 49° 0′ 8″ in both Point Roberts and along the U.S. border north of Bellingham. At 100 feet per second of latitude, there is plenty of 49° on the U.S. side, which makes activating CN89 too interesting to pass up. I decided to fly to the grass strip on Point Roberts and then hike the 1.5 miles to the CN88/CN89 boundary. This challenged me to make the radio and antenna set-up portable (backpackable) in addition to usable from the car and airplane (while on the ground, of course). That was an incredible rush. Alas, it wasn’t overly productive QSO-wise. Better time management. I’ve learned a lot about time management from VHF contests and the Fall and Spring Sprints. This year I should be able to work an extra grid or two, and most will be activated from better locations. More bands. 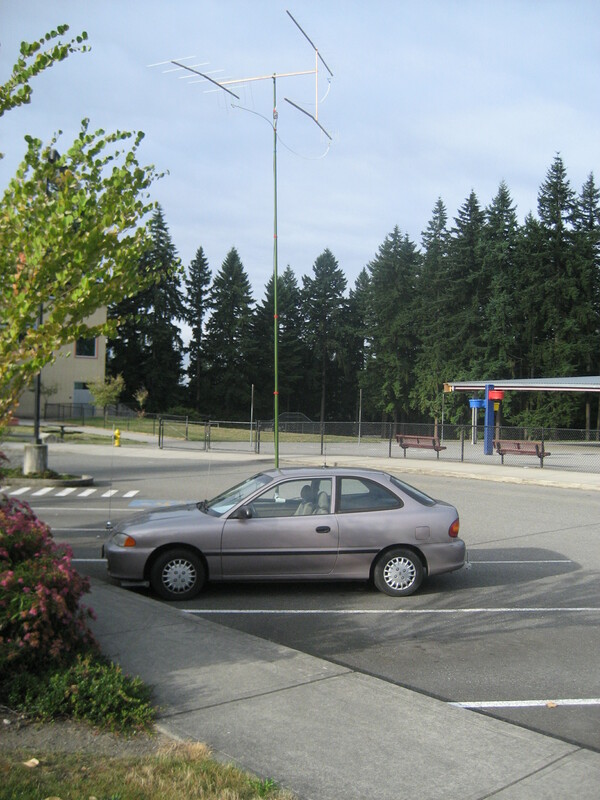 As a limited rover, I can use 4 bands (222 MHz, 432 MHz, 902 MHz, and 1.2 GHz). Last year I only had equipment for 432 MHz (all modes) and 222 MHz FM. This year, I’ll add a 1.2 GHz transceiver. It’s an FM-only, one watt Alinco DJ-G7 handheld. I’ll pair it up with a Yagi, and, before the contest, I’ll beg the local VHFers to have mercy on me and switch to the FM simplex frequency of 1294.5 MHz. More power. Last year I was limited to 25 watts on 432 MHz from my Yaesu FT-857. This year, I’ll have a 100 watt amp to supplement the signal. Better antennas set-up. Last year I used my airplane set-up out of the car (like this). It was slow to set up, and a little error prone. This year, I’ll use the outboard rotor and telescoping mast I used during the past few contests. More antenna gain. Last year I had a single quagi for 223.5 MHz and a pair of quagis for 432 MHz. This year, I will have three stacked yagis for each of those bands, antennas I tried out during the Spring sprints. I’ll also have a single yagi for 1.2 GHz on the car. If I use the plane, I’ll probably have a pair of yagis for 223.5 MHz and 432 MHz, and a yagi for 1.2 GHz. We’ll see if I have time to get all these things finished in the next four days! Better antennas while driving the car. I’ll have significantly better vertical antennas for 432 MHz and 223.5 MHz while in motion. I should also have a 1/4 wave whip for a 5 watt HT monitoring 446.5 MHz full time (that netted a few QSOs for me last year). So, if I actually pull everything together in the next few days, I should have a pretty competitive set-up for the 2012 ARRL UHF contest.